Whether they are thick slabs of portobellos or the slender sprouts and caps of enoki mushrooms, these simple fungi may look plain but can add big flavor to a mundane meal. 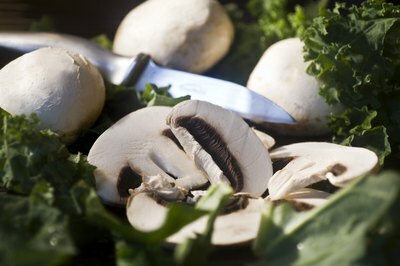 White button mushrooms are commonly seen at the grocery store, but don't rule out wild varieties such as chantrelles, black trumpets and porcini to finish off a pasta sauce or add texture to a casserole. No matter the variety, it is important to judge whether a mushroom is spoiled. 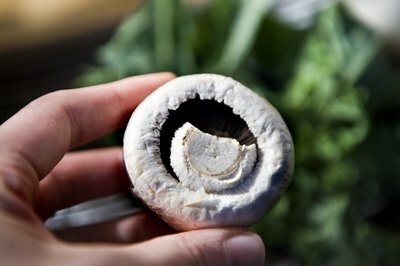 Follow a few quick methods to see if your mushrooms are fresh and safe to eat. Look at the mushroom. Mushrooms should have evenly-colored flesh. Avoid using mushrooms if the skin is mushy, spotted or shriveled. Feel the mushroom. Heavy, firm-fleshed mushrooms are ideal. The mushroom should be dry and relatively clean. Avoid mushrooms that have a slimy coating around them. Look at the gills. Flip a mushroom over and look to see if the gills are open. 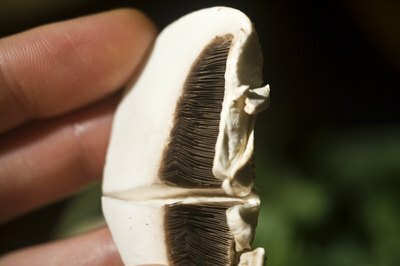 Closed gills indicate mushrooms are young, while open gills signify that mushrooms are older. If the mushroom has shriveled or wet gills, they have spoiled. Do not eat mushrooms that have mold on them or smell bad. Store fresh mushrooms in a brown paper bag for up to 2 days in the refrigerator.